Both authors highlighted that oral midazolam premedication, still a common tool for managing perioperative anxiety, leads to its own logistic and childhood behavioral problems. Some of the related research has been collected here on metajournal. 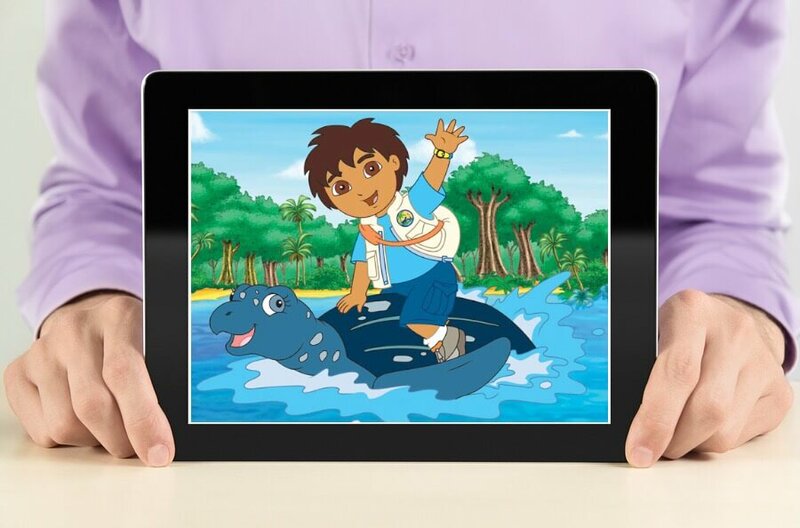 Lee's team investigated the use cartoons chosen by the child displayed on a tablet or laptop computer during the induction. 130 ASA 1 or 2 South Korean children aged 3 to 7 years old were admitted and cannulated the night before, then underwent intravenous induction (thiopentone or ketamine). Surgeries included tonsillectomies, herniorrhaphy and ophthalmic surgery. Three groups were compared: control; favorite toy; and cartoon distraction. While the group permitted to bring their favorite toy had significantly lower pre-operative anxiety than the other groups in the pre-anesthetic room, the cartoon distraction group demonstrated the lowest anxiety level in theatre. Not only was the average anxiety level for the group lower (45% lower than the control, 26% lower than favorite toy group), but also the number of children showing no increased anxiety was the greatest (43% versus 23% and 7% for favorite toy & control groups respectively). All results were statistically significant. Lee's study was a prospective, randomized trial, although not blinded. The cartoon was started in the pre-anesthetic bay and parents accompanied all children for their induction. Four children were excluded from the favorite toy group after forgetting to bring the toy, and these were unfortunately not included in the analysis. Although non-ideal statistically, it is likely that including them in the analysis would only have further improved the demonstrated benefit of cartoon distraction. Moderately sized, single-centre, randomized controlled trial. Did not analyze with intention-to-treat. Potential observer bias. Study demonstrates a significant improvement (up to 45%) in a problem experienced by at least half of all pediatric surgical patients. Maybe limited outside countries where night-before admission and cannulation is the norm; or where parents are not routinely allowed into the OR. Given ubiquity of both portable video devices and children's love of cartoons, would be easy to institute with very little cost. Can be applied by individual anaesthetist. 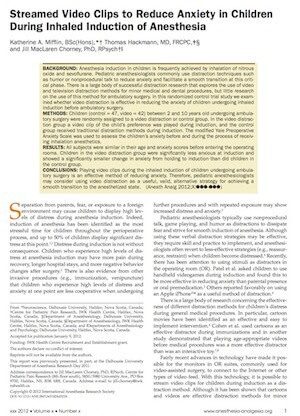 Mifflin and team designed an elegant study, comparing 42 children distracted with cartoons in theatre to 47 controls exposed only to the humor and jokes of their anesthesiologist.3 Children aged between 2 and 10 presenting for ambulatory surgery were selected for the study and underwent inhalation induction with nitrous oxide and sevoflurane. No analyzed children were premedicated. In her preamble, Mifflin also highlighted Kain's findings, associating peri-operative anxiety with "...more pain during recovery, longer hospital stays, and more negative behavior changes. "3 As well as mentioning the questionable benefits of other anxiety-alleviating techniques, such as parental presence at induction. "Children in the video distraction group were significantly less anxious at induction and showed a significantly smaller change in anxiety from holding to induction than did children in the control group." Average anxiety measured by the 'modified Yale Preoperative Anxiety Scale' was 61% lower in the video distraction group than in the control. The median of mYPAS differences between each group was 31.2 (95% CI, 27.1?33.3), or almost half the average mYPAS score of the control group. Again, all results were statistically significant. Mifflin also experienced participant loss and then failed to analyze by intention-to-treat. Unfortunately the two subjects lost were from the video distraction group, one through withdrawal of consent and the other inadvertently premeditated. There was no blinding, although Mifflin attempted to identify observer bias using two coder observers for 20% of the cases. No bias was evident, though this technique is far from perfect and true observer blinding would be preferred. Unlike the Lee study, almost all children were unaccompanied by parents (only 2 in the study group and 3 in the control had parental accompaniment), reflecting the local institutional practice. Also of marked difference, all children received inhalation induction for day ambulatory surgery, compared with night-before admission and intravenous induction in Lee's studied group. Both teams used the modified Yale Preoperative Anxiety Scale for measuring perioperative anxiety. 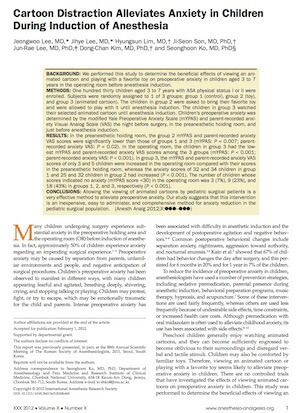 Study demonstrates a large improvement (up to 61%) in a problem experienced by at least half of all pediatric surgical patients. Maybe limited outside of ambulatory surgery; outside of inhalation induction; or where parents are routinely allowed into the OR. Given ubiquity of both portable video devices and children's love of cartoons, would be easy to institute with very little cost. Researchers themselves conducted study without requiring any extra equipment. In the right setting with only limited preparation, cartoon distraction at induction is easy to institute with little risk and a large benefit. It is the differences between these two studies conducted on opposite sides of the planet that make the results all the more interesting. Taken individually it would seem questionable to apply their findings to other surgical settings: ambulatory surgery versus admission; intravenous versus inhalation induction; pre-cannulation versus cannulation; parental presence versus none. Despite these marked cultural and practical differences the degree of the improvement in peri-induction anxiety was very consistent: from 40 to 60% reduction in the children's mYPAS score with a very simple, practical and cheap intervention. While it would be hasty to generalize this to all pediatric cases, there was clearly a benefit for these two disparate practice flavors. I must conclude with a sober note though: while the studies both show dramatical reductions in anxiety we cannot assume that this also translates into an improvement in post-operative behavioral changes in children. Let us hope it does, but these studies alone are not yet enough to conclude that. Nonetheless it is time to consider how video distraction may improve your pediatric anesthesia practice.